"41UR315, 2003.08.1342" by Timothy K. Perttula and Robert Z. Selden Jr.
DECORATION (INCLUDING MOTIF AND ELEMENTS WHEN APPARENT): The rim has an engraved continuous scroll repeated four times around the vessel. the scroll does not have a central scroll line. The upper and lower scroll fill zones are elongated triangles with two columns filled with cross-hatched engraved lines; these are divided by a single vertical engraved line. Ripley Engraved, var. 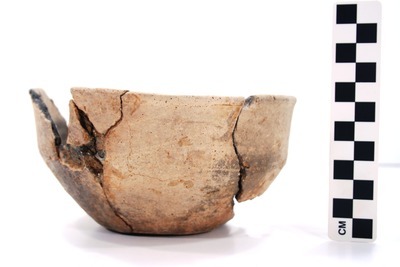 Carpenter carinated bowl, Vessel No. 2003.08.1342.